Since I first started gardening a few years ago, the month of August has always been about tomatoes. But now that we've settled into our little farmhouse - one that happens to have an old fruit tree planted in front of it - I can happily say that from this moment on, August will be about peaches as well. I've always dreamed of living in a home surrounded by fruit trees, which is partly why I spent much of this past spring planting over a dozen all around our one acre lot. Growing up in Philadelphia, I don't recall seeing many vegetable gardens (maybe because there was never much of a yard attached to any of the row homes in our neighborhood). However, to this day, I can picture the several fruit trees and shrubs that doted the urban landscape. I was fascinated by them. And along with a few childhood friends, even raided a few of them. They seemed out of place yet very special - a reminder that there was a greener world that existed beyond all of the row homes, alley ways, asphalt and concrete. I guess in many ways, this fascination has stuck with me, despite the fact there's a lot more greenery in my life these days. One of the first things I did when we moved in last year, was to rejuvenate this old peach tree. I'm not quite sure how old it is, but the woman who lived in our home years ago told me during an impromptu visit (and trip down memory lane) earlier this summer that the tree was here when she first moved in back in 1974. None of our older neighbors can recall a time when the tree wasn't here. In any case, I pruned several decades worth of dead branches from the interior of the tree last fall. Then in late winter, I removed a major top limb that grew towards the middle of the tree in order to allow more light to reach its center. I probably should have also trimmed back and removed a number of smaller branches as well, but this seemed like a good place to start. In any case, I was more than thrilled to see the tree produce thousands of small pink blooms this past spring. Then it went on to set hundreds of small immature fruit. Unfortunately as the summer progressed, the tree did not shed as much fruit as I would have liked. So the peaches we harvested were more the size of large plums. However, the quality of the fruit was pretty impressive. I can see now that growing perfect organic peaches can be much easier than growing apples or pears. While some of the fruit had small blemishes, most looked perfect. Of course the best looking fruit were found near the top of the tree. These peaches were exposed to the greatest light and hence had the greatest amount of blush on their skins. 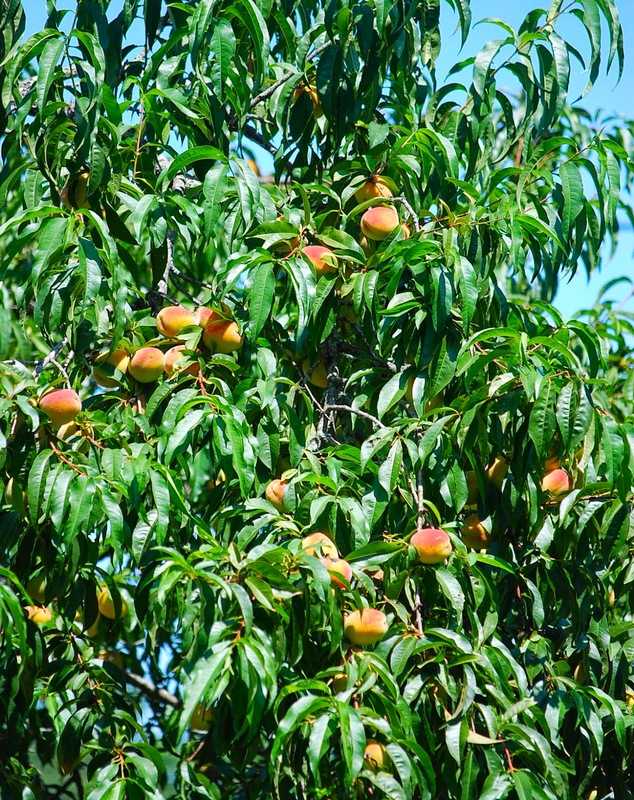 Standing underneath the tree and looking up at all of the ripe peaches, you can't help but feel like a kid again. It's a magical sight really, and one that I hope my son will remember when he's older. Over the course of two and a half weeks, we picked several large bucketfuls - more peaches than I could count - and ate our fill of fresh peaches each day. The rest, I peeled and froze for use this winter or made into a firm fruit spread (to be eaten with cheese), which I canned. Of course, when you have an old tree, it can be quite a challenge to reach the fruit at the very top. 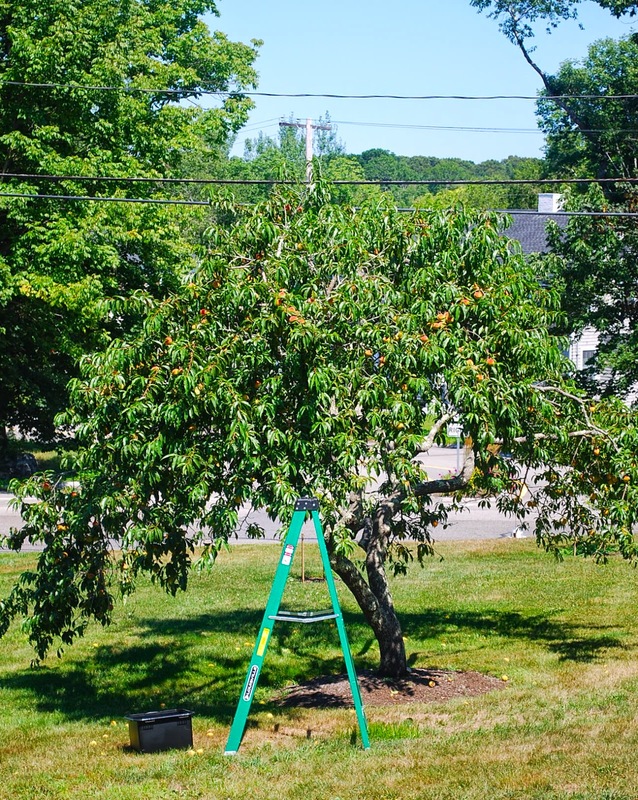 Having a ladder helped somewhat, but we ultimately bought a handheld fruit picker, which attaches to any long pole. We happened to use the pole that came with our roof rake. It worked great, though next year, I'll probably line the bottom of the basket with some bubble wrap to protect the extra ripe ones from bruising. Of course we had quite a few windfalls as well. Hundreds I would imagine. We were able to salvage a few of them, but since I was traveling for much of this month, most of these started to rot on the ground and ended up on the compost pile. 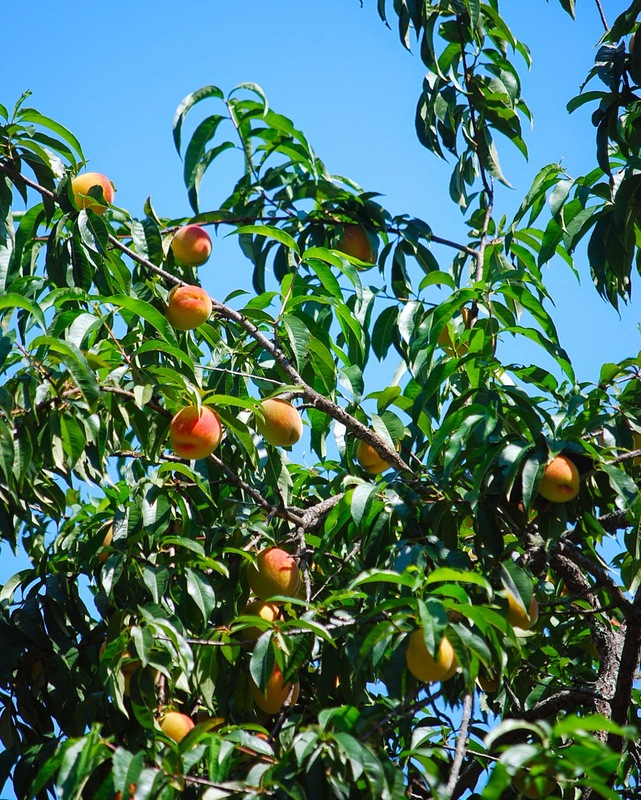 I hated to see so many go to waste, but when you have hundreds of peaches hanging from a tree like manna from heaven, the loss became much more bearable. I'm not expecting the harvest to be this good every year, but the fact that one tree can offer up so much goodness gives us plenty of reason to be thankful. We were glad to be able to share the bounty with many of our neighbors as well. 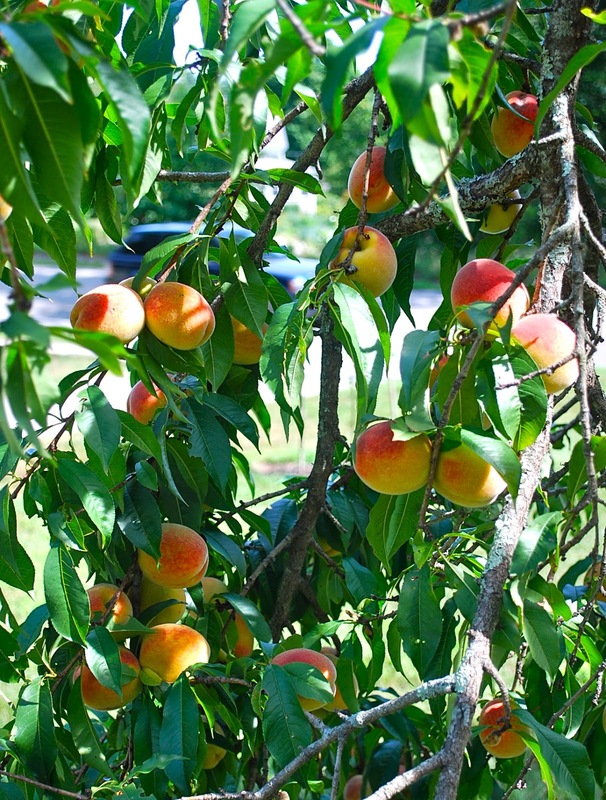 Hopefully our old peach tree will continue to produce for many more years to come. And to think that we owe our good fortune to an unknown prior owner who had the good sense to plant a fruit tree. To this person, I offer our sincerest thanks! And we're back! I can't believe it's been so long since I've last posted a blog update. Between traveling for work, daily house chores, weeding, harvesting, fall planting and preserving, I haven't found much time or motivation to blog. Summer is flying by and we're trying to soak up as much of it as we can before fall arrives. August is all about tomatoes in our garden. I was a bit concerned earlier this summer that our tomato harvest this year wouldn't be as productive as it's been in years past. For one thing, it usually takes at least a couple of years to really build up the top soil in any newly installed vegetable garden. Also, the weather has been so mild this summer. I can only recall a couple of weeks in July when temperatures reached above the upper 80's. For the longest time, it seemed as though our tomatoes were adamant about staying green. Slowly, they started to turn in early August, and since then, began to ripen in droves. Our paste tomatoes (Amish Paste and Speckled Roman) have been ultra productive. And the flavor of our heirloom tomatoes have been excellent too - very rich, sweet and juicy. Once you start growing your own tomatoes, it becomes really hard to even stomach a mealy/tasteless supermarket tomato. Beyond the tomatoes, our cucumber and zucchini plants continue to produce. I'm very happy with how they've performed this year. Cucumber beetles and powdery mildew were such big issues in our old garden that our cucurbit plants and harvests were usually finished by late July. ﻿These things are still present in our new garden (I'm down to two zucchini plants), but not nearly as bad. If we're lucky, we'll still be able to harvest cucumbers and zucchini in September. Dragon's tongue beans are among my favorite string beans to grow. Unlike other bush type beans, they continue to produce pods over a long period. Tomatoes of all colors, shapes and textures. I love the fluted shape of 'Costoluto Genovese'. Most of our tomatoes are used to make sauce. I try to make and freeze enough tomato sauce to last us all year long. I think we've met that goal this year and then some. In any case, there's already a chill in the air at night. Our friends in Vermont are already seeing leaves changing color. Something tells me that fall will arrive early this year and that the upcoming winter will be a harsh one. If this turns out to be the case, it's nice to know that we can still heat up some sauce and enjoy a bit of summer even when it's cold outside. This Week's Harvest - It's Officially Tomato Season! The tomato harvest is slowly picking up this week. Our paste and cherry tomatoes were the first to start ripening, but now we're also getting a few beefsteaks as well. I always look forward to this time of year when our harvests seem to explode into bright shades of red, purple, orange and yellow. It's a sure sign that summer is at its peak. I'm growing four cherry-type tomatoes this year. Sungold and Black Cherry are my long time favorites. Isis Candy, when allowed to ripen fully, has a very sweet and fruity flavor. Blush (the small elongated yellow striped tomato at the center) is a new discovery for me this year. Branded as an "artisan" tomato -meaning it will grow true to seed but is not considered an heirloom), it's also very sweet and fruity tasting. Aside from tomatoes, we are getting plenty of other veggies as well. For the moment, our tri-color bush beans are still producing, though the plants themselves are beginning to fade. I like growing bush-type beans because growing pole-types on trellises has always seemed like such a chore. The downside is that you get flooded with beans for several weeks and then suddenly they are gone. This is my first year growing Speckled Roman. The gold streaks on this tomato seem to jump right at you and is like nothing I've ever seen before. They are like little volcanic stones. 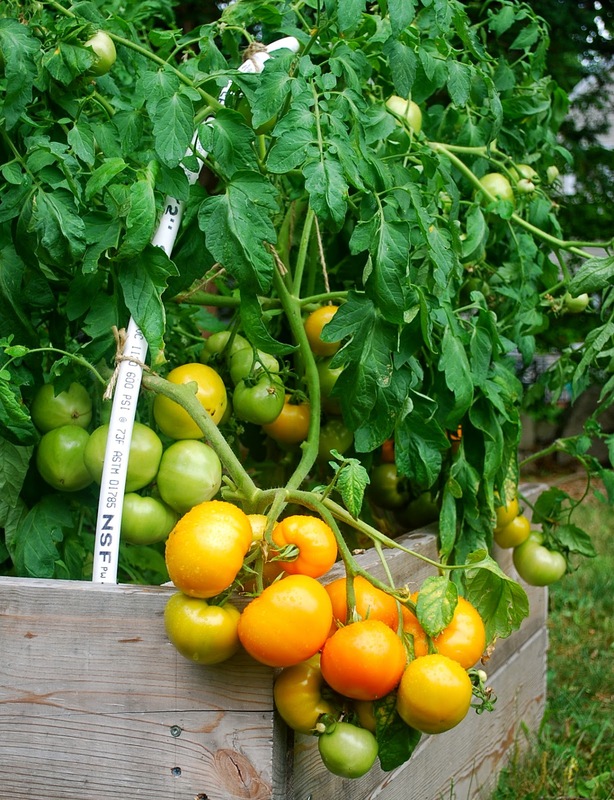 I only grow one type of determinate tomatoes - Orange Blossom. This is one of my favorite tomatoes. The plants themselves produce copious amounts of fruit. The fruits themselves are the perfect size for single servings. Unlike the heirlooms in my garden, this tomato is on the firmer side and tends to hold up well in a sandwich. But the best part about this tomato is the flavor. It has the perfect balance of sweetness and acidity in my opinion. Aside from the beans, the garden is still producing an abundance of summer squash and cucumbers, though I've chosen to spare you all any more pictures of them. I did end up picking my first delicata squash this weekend (though by accident). It snapped off in my hand as I was inspecting it. I also picked most of our chioggia and golden beets this week to make way for fall veggies. Last but not least, we picked our first sweet corn of the season today, which we prompted had for dinner. I'm growing a variety called 'Sugar Pearl' this year. In my opinion, nothing comes lose to homegrown corn, especially when it's picked at the precise right moment. The kennels snap and pop in your mouth. While our corn tasted excellent, I made the mistake of growing my plants too close together. Since we had a limited amount of growing space this year, I got greedy and planted more than I should have. Hence, the ears were smaller than in years past. However, I plan to devote a larger patch for growing corn next year.